I know how it is. You’ve put together all the planning pieces you could ahead of time, and it’s finally the day of event. This means you might be working with multiple groups to get your space ready, from the venue itself to vendors, volunteers, or even your client. You can be pulled in so many different directions that it’s difficult to keep track of what needs to be done. This is why it is important to have a day of event set-up schedule. It can be enticing to fly by the seat of your pants and assume you can figure everything out, and the fact is that if you are a decent problem-solver, you just might be able to… but this strategy will only add to the stress you’ll already feeling about pulling off a fabulous event. 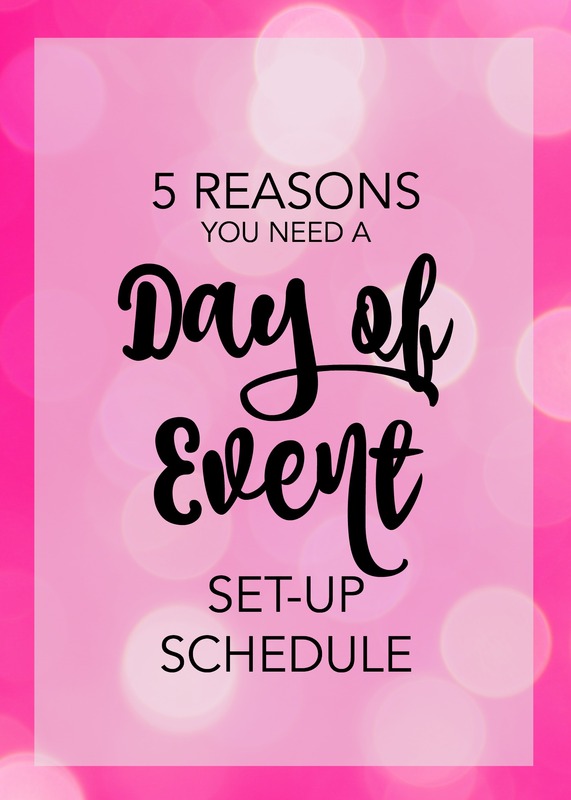 In order to make sure your event execution goes smoothly, you should spend some time creating a day of event set-up schedule. This can take whatever form works best for you. For some events a simple checklist will suffice perfectly, but for those with more moving pieces, it can work better to have a full schedule including allocated times to get certain things done. Either way, putting a plan together is important for many reasons, as I’m going to outline below. Creating and distributing a set-up schedule ahead of the day of event will ensure that all of your volunteers, staff members, vendors, venue coordinators, caterers, and anyone else involved have the same information and know exactly what you are counting on them to get done. If you send it out to any stakeholders ahead of time, they can be held super accountable for carrying out their duties when it actually comes to the day of event. When setting up for a major event, it’s easy to get wrapped up in only the big things that need to get done, even though it’s the small things that really make your event soar. Use your day of event schedule to slot in those smaller things that might easily slip through the cracks. Assign them to a specific person to do, and make sure that person has the skills or knowledge to complete the task. Any event execution is stressful, so why wouldn’t you plan ahead to minimize any extra issues? Coming up with a document outlining exactly what needs to be done and following it is a lot simpler mentally than trying to cover everything on the fly. That way all your brainpower is free to troubleshoot any other problems that might come up! Preparing a set up schedule or checklist means you have something easy to review when you think you’re all done. If you do an accurate job of preparing this list, it’ll be impossible to miss even the smallest details. When everything is ready to go, sit down with your group and go over all the points to make sure each one is under control. Running events can be challenging, but there are a few things you can do to make sure you’re setting yourself up to come out on top. Your event planning habits should keep you organized, and being organized means coming in with a plan. So make sure you have a plan for how you’re going to pull off your event preparation! Do you want more information on what should be in your day of event schedule? Well, you are in luck! I’m offering a FREE checklist of things that must be included in your set-up schedule in order to ensure a successful event. Click the button below to sign up for my email list and receive this awesome freebie! Thanks for reading today and don’t forget to stay tuned for even more event planning resources! And if you need any more help on laying out your day of event schedule, throw your questions in the comments or drop me a line at info@kristinglassevents.com.